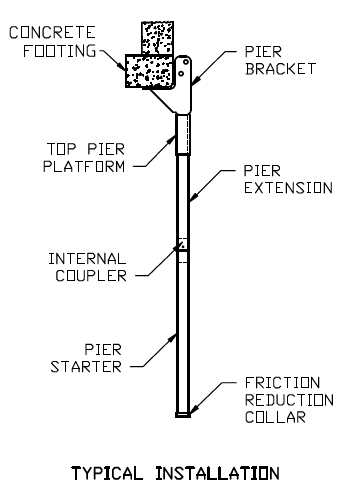 Want more technical information on Resistance Pier systems? Some homeowners may want a little more information on the technical and installation side of Resistance pier systems. If you’re interested in things like load capacities and torque ratings, then you’ve come to the right place! The process of Resistance (also called “Push”) piering provides a stable base by transferring the weight of the structure or home to solid soil found at or near the bedrock below. Resistance piers are installed by attaching the pier bracket to the footing. With this approach, we will notch out sections of the footing to get the bracket and pier under the center of the footing at it’s strongest point. Then, the piers are then hydraulically driven (“pushed”) through a slot in the bracket until they reach the solid soil or bedrock beneath your foundation. Next, the piers are load tested before the weight of the home is finally and permanently transferred. In most residential applications, 3D Structural will use the Two Piece Under Footing Resistance pier. Depending on the weight and size of the structure, and pier spacing, pier pipe diameter will usually be 2-7/8 in. or 3-1/2 in. The pier starter section is designed with a friction collar to reduce soil friction as the pier is pushed to depth. Each pier section is approximately 3-1/2 ft. in length. In some commercial foundation repair applications, an engineer, builder, or architect may specify a specific load capacity and torque rating. In these situations, 3D Structural will follow the specifications to ensure the desired capacities are achieved.